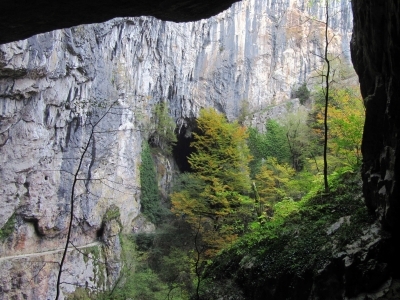 The Škocjan Caves are one of the most unique limestone cave sytems in the world. This karst landscape is shaped by the Reka river, which has sought its way underground. Specific features include dripstone as well as underground gorges, lakes and waterfalls. In several places the cave ceiling has collapsed, which has resulted in four deep fissures on the surface. The total length of the underground passages is 5 kilometers, and they go up to 230 meters deep. 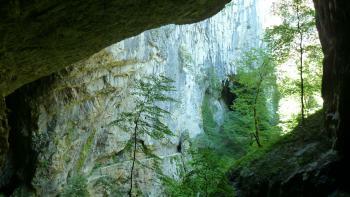 Škocjan also is an important scientific site for the study of the karstic phenomena since the 19th Century. The geological terms "karst" and "dolina" originated there. 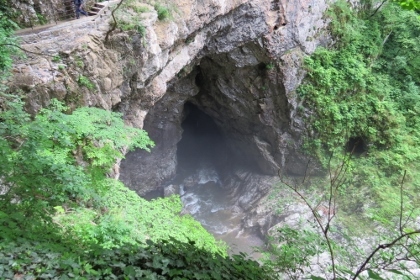 Škocjan has been preferred to the nearby caves of Postojna for World Heritage status.The latter are better known and larger, but also much more affected by tourism and pollution. Slovenia’s Top 3-tourist sights probably are the Lake of Bled, the Postojna Caves and the horses at Lipica. The Skocjan Caves are much less known, but that doesn’t mean that you’ll be the only one visiting. Some 80 people showed up this Thursday for the 10 a.m. guided tour. Fortunately we were divided into 3 groups later on when entering the cave system, but a “mass tourism alert” certainly is appropriate here. Skocjan lies just next to the main highway going southwards from Austria/Ljubljana to Croatia. The road is full of caravans and motorhomes heading south. The dripstone formations are there of course, but I found them not really spectacular and I’ve seen better ones at several other WHS. The trail starts at the Silent Cave, which mostly is one big and empty hall. You can admire the size of it. After the silence, the noise of the flowing river announces the second big cave. The river nowadays flows at the bottom of the caves, and you’re far away from it. There’s a sign indicating that the caves were flooded in 1965, when the water came all the way up to the upper caves. After 1 hour and 45 minutes we were back at the entrance. The 16 EUR ticket was a steep price to pay, as the guide only made 3 small talks en route. Before and after the tour I walked around a bit to see the cave system from above. The natural surroundings are pretty, covered by thick forest. From a viewing point you can see the river on the surface, the same one that ducks underground. These caves are very impressive, and the visit is see them is definitely worthwhile. However I did struggle a little bit with understanding why these caves, compared to the many other impressive caves systems around the world, are under the protection of UNESCO. Nevertheless, I can certainly recommend a visit. There are three tour options available, Tour 1, the classic Underground tour for EUR 18 per adult, Tour 2, to follow the Reka River further, for EUR 12.50, or a combined ticket for both tours for EUR 24 per adult. Tour 1 is guided only, with no photography allowed, whereas Tour 2 is self-guided and photos are allowed. I opted for Tour 1 only and was pleased with this decision. Tours run hourly, on the hour and take around 90 minutes (excluding the walk out at the end). Initially all ticket holders are walked together for around 800 meters, off the visitor centre site, along the road, into the forest and down some steps to the cave entrance. I wasn't expecting this!! At the cave entrance the group of around 50 people was split into two groups, one for Slovenian speaking visitors, one for English speaking. On the day I visited, around 45 visitors were English speaking. We then had a briefing on the discovery of the caves, the geography of the area and details regarding our visit. Entering the caves, you pass through two caverns, large but not huge, filled with stalactites and stalagmites. I was not particularly impressed with these sections and was worried the visit would be a disappointment. However soon you can hear the river beyond and after descending a number of steps we popped out high up the side of an enormous cavern, the river running gently (in a dry September) far below. The view here is breathtaking. You then walk along the edge of the cave descending further to a narrow bridge spanning the cavern, 45 meters above the river below, to protect it from the frequent floods. This cavern is by far the most impressive part of the visit and I found it disappointing that there is a no photo policy. Next we ascend a large number of steps to emerge back into daylight. A lift takes visitors back up to the visitor centre, or you can take a 40-50 minute walk back. I can heartily recommend this walk, as you get to see an impressive waterfall, the extent of the collapsed roof of the cave system, and enjoy the woodland areas. This path is actually the first part of Tour 2 but you don't need to have paid for this tour to enjoy the walk out. The guide was engaging and knowledgeable, stopping several times to give explanations. However he did not speak loudly enough for the whole group to hear, which was a shame. The visitor centre has a small museum, toilets, large parking area, souvenir shop and a cafe/bar. There is a shuttle bus from here to the nearby town of Divaca, but as I had my own transport, I am not sure of timings. Overall a really enjoyable half day. I love caves, so when a friend of mine suggested visiting Slovenia last fall, I leapt at the opportunity to explore the karst topography of the Škocjan Caves. I had read up on the caves beforehand, and had planned on taking both the official tour of the cave and the unguided walk following the Reka River (which really is a bit redundant) underground. Unfortunately, I learned the unguided river walk is unavailable in October, and the guided tours did not overlap in such a way that I could do both in one afternoon. I opted for the official Underground Canyon tour, which included beautiful limestone formations, similar to what I've seen in many other caves. The canyon itself was impressive, with the roar of the Reka rapids filling the cavern. I remain convinced a surreptitious photo could be taken at the canyon, despite the prohibition (which is ostensibly for safety). I was most impressed by the blocked off narrow stairs, walkways, and rope bridges previously used by cave explorers and early tour groups. With the extra time after the tour, my friend and I walked the trails around the Škocjan doline, enjoying the autumnal scenery. We also visited the cave museum, which included memorabilia and interesting stories from early explorers. I really enjoyed these caves. 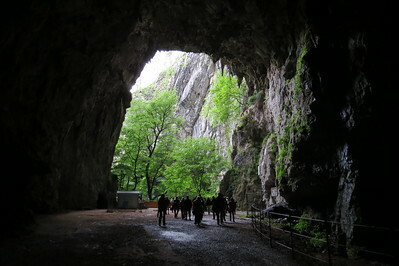 Logistics: Škocjan Caves can be reached by private transportation or by train via the town of Divača; a shuttle runs from the Divača train station to the caves, and a hiking trail also connects the town to Škocjan Caves. I went on a Sunday in July 2015 and found the visitor centre thronged with people – mostly Slovenian tourists it seemed. 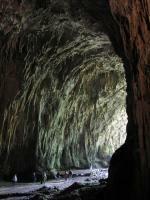 The temperature was in the high 30s, making the caves an attractive refuge. At €16 it isn't cheap, but is worth it. Note that the €35 permit required to drive in Slovenia only seems to apply if you go on the motorway system. If you are coming in from Trieste then that is not necessary (although it we did use it to go to Idrija the next day). We were led down to the cave’s entrance in a huge group of at least 70 people, so it was a relief when the guides announced we were going to be split into three groups, by language. Inside the cave one sees a remarkable chamber of stalactites and stalagmites, followed by a descent reminiscent of journeying into the bowels of Mount Doom. The cave opens up into a much larger cavern as the tour proceeds to link up with the underground Reka river (one of the many tautological river names in the world). After crossing a stunning bridge, the path winds its way out of the caves and into the semi-daylight, where bats swoop from the ceiling, despite being nocturnal. The walk back up to the visitor centre was rewarding, affording us views of the Reka rushing through gulleys and funnels. I visited this WHS in May 2014. I wasn’t expecting much, especially because I knew that the best way the experience the underground canyon in the Skocjan Caves was to go for the 2hr guided tour with another 20 people and that no photography was allowed, not even without flash. The 2 hour guided tour takes place at 10am, 11:30am, 1pm, 2:30pm and 3:30pm. A huge group gathers in front of the ticket office and 3-4 guides lead the way to the entrance to Skocjan Caves. The walk and brief introduction takes around 15-20mins downhill and then each guide accompanies a group of around 20 people. The guide of my group was quite knowledgeable and made the visit quite interesting without giving too much detail. Photography is not allowed expressly to make sure that no flash photography takes place since it may damage the cave and to discourage people from loitering behind the rest of the group. I must admit I was naughty and I was the one to enter the caves last on purpose to take a couple of photos when I wasn’t under the guide’s strict supervision. I’m extremely happy with the few photos I took and the video with the deafening sound of the underground rapids. I didn’t keep the group waiting and I didn’t do any harm to the cave. After the 2 hour guided tour inside the caves, I did the 1.5hr self-guided tour which was included in my combined ticket. 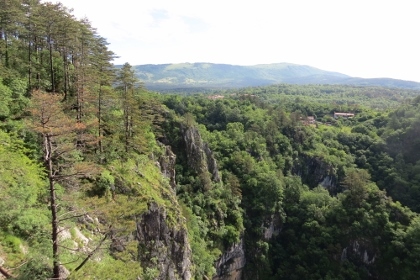 This trail gives you the opportunity to take photos and to admire the Skocjan Natural Park’s exterior beauty with waterfalls, limestone gorges and a great panoramic view opposite the church. Still it’s no substitute to the underground canyon experience! Besides the guided tour of the caves described by several people here, there is now a second route with an unguided tour which I followed. This can be done at any speed, and photography is allowed. Guides are located at strategic points along the route armed with radios to ensure that no one gets lost. The caves on this route are much as described with sink holes, rushing streams, waterfalls and vertiginous bridges. I reached the caves by shuttle bus from Divaca station. Trains from here go to Koper (for buses to Trieste and Porec), Sezana and Ljubljana. There is a new inexpensive Italian style restaurant in Divaca where I had pasta while waiting for my train. I was rather impressed with this magnificent cave complex and the wonderful surrounding countryside. Whilst I don’t have a huge amount of knowledge to judge the quality of these caves compared to other examples on the World Heritage list, I can certainly say they were a spectacular site. The first part of the guided tour takes you through a complex with various impressive examples of stalagmites/tites and other forms of dripstone. The guide did a pretty good job of explaining how, why and for how long they have formed; we were then led into another rather massive chamber. After that came Europe’s largest underground canyon. I wasn’t really expecting it to be so remarkable, from the moment we entered it you could hear the water thundering below. After plucking up the courage I peered down to see it bubbling and gushing deep below me. The recently added bridge is rather magnificent and gives a wonderful sense of scale as you stare down at the huge drop below. One thing I hadn’t appreciated beforehand was how pretty the area outside the caves is. The exit from the underground section brings you to a very lovely gorge which looked at its very best in the bright early summer sunshine. The high temperature and mildly tight time frame meant I decided to ride the funicular railway back to the top; however on another day I think I would have enjoyed the 50 minute walk through the gorge, to see the rock arches and waterfalls up close. At the top there was another fine view point of the surrounding area. 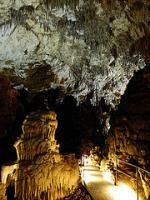 The caves are located a short way from the tiny town of Divača, which had a free shuttle bus that coincided with the arrival and departure of trains to/from Ljubljana. If like me you are using public transport to get to the caves it is worth taking note that despite them being only 10 miles from central Trieste there are essentially no transport connections between them. So heading from Ljubljana is perhaps the easiest way, unless like me you want to sample the Tito-era frontier town delights of Nova Gorica. Apart from the free shuttle bus and a friendly if slightly down at heel bar, there isn’t a huge amount to do in Divača, so I would recommend sourcing your food and drink at the slightly pricey but very tasty restaurant at the caves. All in all I was really impressed with Škocjan, the underground trail was very impressive and above ground was a delightful surprise. i have recently visited the caves. I was lucky that it was raining and the river was powerful with rapids. I was amazed at the size of the cave. I have never experienced anything so magestic. the guides where great and informative. 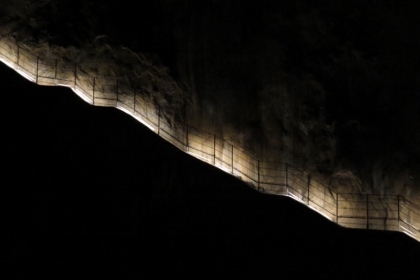 Less famous than the renowned Postojna caves, the caves at Skocjan in southwestern Slovenia near the coast are certainly no less impressive and more important from a scientific point of view. They are the classic karst caves and are much less polluted than others, forming their own ecosystem and hosting several endemic species. Besides, they are extremely impressive, with huge stalactites and stalagmites, a river running through it and a mighty canyon with a footbridge 40 metres above the water that makes your knees shudder... The guided tour takes about an hour and a half and is pretty strenuous, since from about the halfway point it is mostly uphill over slippery steps. Despite this, a visit there is just fascinating and highly recommended. The caves can only be visited on a guided 2-hour tour where you will visit 3 kilometers of the total of 6 kilometers of tunnels and rooms filled with stalagmites and stalactites. The biggest chamber you'll visit (the largest one in the cave system is too dangerous to visit) is impressive. After the big chamber you will follow a path along the underground river, which is quite amazing, and a little scary too if you are afraid of heights. Finally you will end up in a little valley with its own ecosystem. The view from the viewpoint is spectacular with high cliffs and at the bottom a waterfall coming out of the caves and a small cliff-side village with a church. Posidonius: Observed that the river Timavus flows underground before emptying into the Adriatic Sea. 196 Community Members have visited.